Step #1 – Complete an enrollment form and submit it at Mid-City Scrap’s Scale House. Forms can be obtained at Mid-City Scrap in Westport, MA or can be downloaded and printed online. Our Scale House staff will process your enrollment form and you will receive a Recycling Rewards Membership card featuring a unique Customer ID that identifies you as a member. 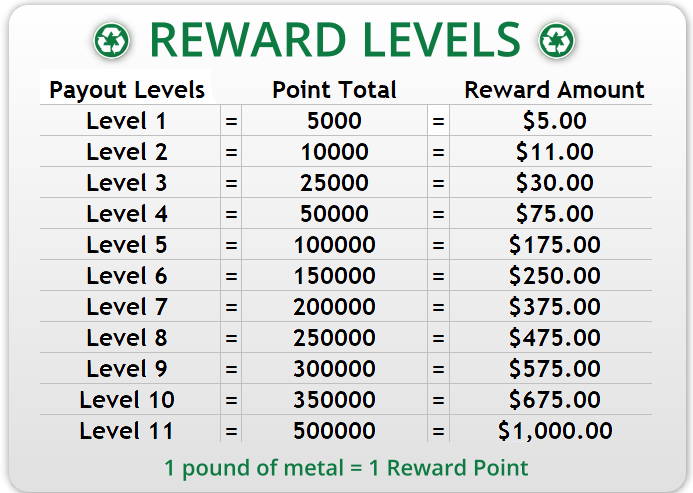 Step #2 – For every pound of metal that you bring into Mid-City Scrap, 1 Reward Point will be awarded to your account. Just present your card to our Scale House employees when you arrive to ensure that your Reward Points are properly credited to your account. Step #3 – Once a member accumulates enough Reward Points, they can be redeemed at Mid-City Scrap for cash – it’s that easy! Q – Do Reward Points expire? A – Yes, Reward Points must be redeemed by the end of the calendar year, no later than December 31st or all unused Reward Points will be forfeited. Q – Can I redeem my Reward Points more than once in a calendar year? A – Yes, Reward Points can be redeemed as many times as you wish and will be immediately deducted from your Rewards Card. Q – Do I have to redeem all my Reward Points at once? A – Yes, you must redeem all of the Reward Points on your Rewards Card at once. The points will be deducted from your card and your Reward Points will start again at zero. Q – Is there a limit to the number of Reward Points that can be redeemed in a calendar year? A – No, as long as you earn the Reward Points in the calendar year, you can redeem them. This is an incentive program, so the more you recycle your materials at Mid-City Scrap, the more Reward Points and money you will earn. Q – Can I combine my Reward Points with family or friends? A – No, you may not combine Reward Points. However, you can use a single Rewards Card with multiple people. The Reward Points will accumulate on the single Rewards Card no matter how many people are using it. Q – How do I know what my Reward Points total is? A – A list of current Recycling Rewards member totals will be posted in the Scale House by Customer ID number on a monthly basis. Q – Will Mid-City Scrap let me know when I reach the next Payout Level? A – No, it is up to the individual member to keep track of Reward Points. Once you reach the desired Reward Points level and choose to redeem your points, just inform our Scale House staff and they will initiate the redemption process. Q – How soon after I request my payout will I receive it? A – Because of accounting procedures, please allow 2-3 weeks for processing. Just return to the Scale House and your cash will be waiting for you. 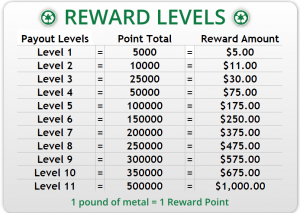 Q – Will I earn additional Reward Points for non-ferrous metals? A – No, at this time non-ferrous metals are calculated in the same way as ferrous metals. One pound of non-ferrous metal is equal to 1 Reward Point.